The history of the Apalachicola area is a patchwork of cultures woven together by the river and bay that surround this unique stretch of North Florida. You'll find echoes of Apalachicola's steamboat era along its historic waterfront and learn about the town's role in the Civil War. 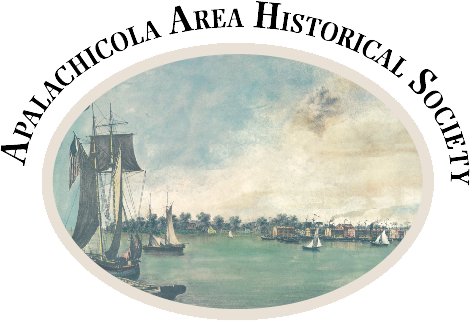 The Apalachicola Area Historical Society is a nonprofit organization devoted to preserving and promoting the area's history and preservation efforts. We welcome you as a member and supporter. The Historic Society manages the David G. Raney House Museum located at 128 Market Street (at the corner of Avenue F) in historic downtown Apalachicola. The Museum is owned by the City of Apalachicola, operated by the Apalachicola Area Historical Society and supported by the Franklin County Tourist Development Council. The Raney House has new expanded hours open to the public 11:00 pm--4:00 pm Monday through Thursday and 10:00 am--4:00 pm on Fridays and Saturdays. We will be closed on Sundays. Admission is free but door donations are accepted. Special tour group requests to visit The David Raney House may be arranged at any time. Please call 850-653-1700 to make the appointment. The Historic Society hosts two "Ghostwalks" in Apalachicola's historic Chestnut Street Cemetery. One is held on the first Saturday in May and the other is on the last Saturday in October . Re-enactors dress up in period costumes and spin a tale about some of Apalachicola's earliest inhabitants. Proceeds from the event are used for cemetery preservation purposes. Donate to the Apalachicola Area Historical Society and you've donated to the preservation efforts of a community and its heritage.